F-gases (hydro fluorocarbons (HFCs), per fluorocarbons (PFCs) and sulphur hexafluoride (SF6)) are new, safe industrial gases used in a number of applications: industrial refrigeration, air-conditioning systems, insulation foam, fire suppression systems, electrical switchgear, and many others. F-gases replaced the ozone-depleting CFCs and HCFCs in the 1990s. They are non-ozone depleting, have low toxicity levels and most of them are non-flammable. However, they have a relatively high global warming potential (GWP). ≈ What is the EU F-Gas Regulation? The F-Gas Regulation, or “Regulation of the European Parliament and of the Council on certain fluorinated gases,” is an EU legislative instrument which is directly (i.e. without any further transposition measures) applicable in all EU Member States. After almost 3 years of intensive negotiations between the European Commission, the European Parliament, EU Member States, industry and NGOs, the Regulation was finally adopted during the first half of 2006. The Regulation specifies detailed containment provisions, particularly schedules for the leak checking of equipment, staff training and certification of people handling fluorinated gases. It also details a mandatory reporting scheme for those producing, importing, exporting and selling these gases, and contains selected bans for emissive, low-societal value uses. ≈ What is the objective of the F-Gas Regulation? The containment, use, recovery and destruction of HFCs, PFCs and SF. The control of certain uses of the gases. The application of ‘placing on the market’ prohibitions on certain products and equipment. The training and certification of personnel and companies involved in activities under this regulation. ≈ Which gases are covered by the EU Regulation? 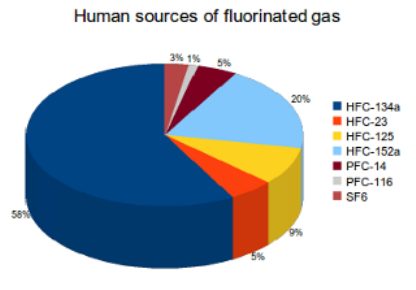 The gases covered by the EU Regulation are the so-called fluorinated greenhouse gases: HFCs, PFCs and SF6. Does the Regulation prohibit the use of certain gases in the future? Does the Regulation prohibit the production of equipment using F-gases in the future? The Regulation imposes bans for certain applications of F-gases. These bans are considered appropriate because viable alternatives are available and improvement of containment and recovery is not feasible. Therefore, the placing on the market of these products and equipment is detrimental to the objectives and commitments of the EU and its Member States with regard to climate change. The use of SF6 in magnesium die-casting is prohibited as of 1 January 2008, unless the quantity of SF6 used is below 850 kg per year. The use of SF6 for filling vehicle tyres will be prohibited as of 4 July 2007. This means that the use of F-gases in all other products and equipment remains legal. However, if a Member State adopted stricter national measures before 31 December 2005 (Austria and Denmark did), these stricter measures can remain in place until 31 December 2012. They must, however, be notified by the relevant Member State to the European Commission before 4 July 2007 and must be compatible with the EU Treaty. ≈ What aspects of the use of F-gases are regulated? As a rule of principle, the Regulation does not regulate F-gases directly; e.g. in terms of production and placing on the market. It regulates their use. The various aspects covered are containment, recovery, training and certification of personnel handling the gases, reporting of data on import, export and use of gases, labelling of equipment, control of use and placing on the market of products containing F-gases. The Regulation also foresees the publication of a report based on the experience of the application of the Regulation by 4 July 2011.